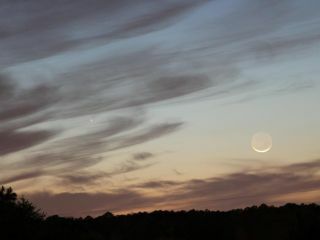 Aaron Kingery, a scientist at the Marshall Space Flight Center in Huntsville, Ala. captured the image of Comet Pan-STARRS on the evening of Tuesday, March 12, 2013 using a Canon DSLR camera. The comet was near peak brightness as it traversed the evening sky. As a television meteorologist, I'm called upon each night to provide details concerning what weather to expect in the days to come. If you are preparing to head outside to observe the night sky, however, sometimes checking with the latest local TV or radio forecast isn't enough. But with the right tools and a little knowledge of practical meteorology, you can make your own judgment call as to whether the sky will be cloudy or clear. In particular, I'm already thinking ahead a half year from now, to the "Great American" total solar eclipse, when millions of people will be feverishly checking the latest forecasts along the path of totality in hope of determining where sunny skies — and the best eclipse views — will most likely be. In the empiricism department, the really savvy weather folks are farmers, sailors and aviators. For the most part, these individuals have picked up a wealth of knowledge over many years by merely going out and judging the state of the sky and noting the changes that take place on either an hourly or daily basis. Later, they can judge how these local changes relate to the much broader regional, national and perhaps even global weather patterns. A good basic book on weather can be an indispensable tool, and I have two that I can highly recommend here. The first is the compact and richly illustrated pocket guide simply titled, "Weather" by Paul E. Lehr, R. Will Burnett and Herbert S. Zim. It is part of the Golden Guide Series from St. Martin's Press and is available either online or in any well-stocked bookstore. The other book has been out of print for a while, but can be purchased at most online book suppliers: "Eric Sloane's Weather Book." This is a great weather resource for either the beginning hobbyist, or the well-experienced professional. Sloane, who died in 1985, was a master geometer, and the crown jewels of his weather book are his series of drawings, showing — some in great detail — the various structures of the atmosphere as well as views of things that often appear in the sky (clouds, haloes, auroras, etc.). Both of these books can be augmented by following the daily weather forecasts provided on television . . . or online (more on that later). Today, forecasters can view a wide range of different forecast models and can pit one against another, or at the very least try to obtain some sort of reasonable consensus. When I was growing up and getting increasingly interested in weather forecasting, my main source of daily weather information was The New York Times. Back then on their daily weather page, was the "official" national weather map from the U.S. Weather Bureau (now called the National Weather Service). Over several years I collected more than a thousand maps that I cut out from The Times and stored them in a boot box ... my "weather archives." National weather forecastsare issued 24/7 from the Weather Prediction Center in College Park, Maryland. From here you can view the latest weather maps, including short- and medium-range outlooks, as well as forecasts involving significant precipitation. That includes snow and ice forecasts during the winter season. You can also peruse the latest technical forecast discussions. Local weather forecasts are issued from nearly 200 National Weather Service offices located all across the 50 states, as well as Puerto Rico, American Samoa and Guam. Just find the state you are located in, then find the forecast office nearest to you and click on the link. You can find all the latest information here, including satellite imagery, radar and hourly weather observations from nearby airports and observation stations. And, of course, the very latest forecast discussions and forecasts both for land and (if applicable) marine interests as well. Weather for Astronomy. This web page provides the latest cloud simulations (as viewed from a weather satellite) to provide astronomers with information to plan their sky-observation activities. The forecasts are for North America and are produced by the global computer guidance models at the Canadian Meteorological Center. Along with cloud-cover forecasts, one can also obtain projections regarding air temperature, winds, humidity and "atmospheric seeing"and transparency of the sky. Check your stargazing weather forecast at Environment Canada's astronomy page. Clear Sky Chart is another excellent weather site that employs data from the Canadian Meteorological Center (CMC). Using this data, Allan Rahill of the CMC has produced charts that span 48 hours that depict when skies will be clear for a specific location. You can go to cleardarksky.com and create a custom sky chart for your home location — or for any location for that matter. As the saying goes, "Everybody talks about the weather, but nobody does anything about it." But today, thanks to the resources listed above, skywatchers can at least anticipate changing weather conditions and, if necessary, make a move to a location where clear weather is anticipated. I suggest you bookmark this particular column for future reference . . . especially as we get closer to the solar eclipse next August.